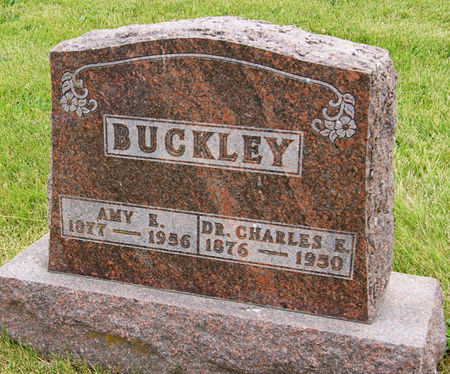 Charles Eugene Buckley, son of John Buckley and Florence, was born July 25, 1875 in Wyoming, Jones Co., Iowa and died April 22, 1950 in Blockton, Taylor Co., Iowa. He married Amy Euretta Cantin Nov. 27, 1902 at Chicago, Cook Co., Illinois. She was born in July 1877 in La Salle Co., Illinois, daughter of Joseph S. and Cornelia Cantin, and died May 24, 1956 near Blockton, Taylor Co., Iowa. Her 2nd husband was Allie Roy Faubion whom she married Feb. 28, 1954. Searching for AMY EURETTA CANTIN FAUBION in Taylor County Iowa?